Kamen Rider OOO filming wraps up: Eiji and Ankh would like to say, thanks. Well, a couple of days ago, UkiyaSeed of Orends: Range posted a whole bunch of cast pics from the last days of filming for Kamen Rider OOO. And recently, both Watanabe Shu and Miura Ryosuke posted there own series wrap ups on their respective blogs. Yesterday, at about 2:30AM, I, Shu Watanabe who plays Eiji Hino, finished with all filming for Kamen Rider OOO. It went by in the blink of an eye. When I first met everyone, the director said, “It goes by in the blink of an eye.” I always thought of what I’d do for a year. While I was thinking of that, the end creeped up on me. Time flows so quickly. It flows 100 times faster when you’re having fun. When I was little I dreamed of becoming a Kamen Rider. Kamen Rider OOO has given me a lot of strength. This will get kind of long, so…. To Hiroaki Iwanaga (Akira Date): We talked so much about what it means to be a man. Our actual ages might be so far apart but mentally we’re the same age. At first I mistook you for an EXILE member, you’re so burly. You always cheered us up on the set with your terrible jokes. I feel like I’ve gained an older brother, it makes me happy. To Riho Takada (Hina Izumi): When I first met you you were 15, but you’re so much more mature than me who’s older. Thanks for laughing at my boring gags on the set. As the heroine to the end, playing strong Hina, you really have a strong heart. To Mayuko Arisue (Erika Satonaka): Somehow or other you could say we worked together 3 or 4 times before Kamen Rider OOO. Since you’re the only other cast member the same age as nervous little me, you became a reassuring friend. You never stopped talking, how many times did you tell me the same stories? lol They’re all good memories, though. To Yusuke Yamada (Uva): Like me, your jokes kept failing too. When we were at the final audition, you were my partner, and I thought your voice was pretty loud. lol When you would sometimes show us your serious side you were pretty cool. To Taito Hashimoto (Kazari): You’re good at dancing and singing so at first you were overwhelming. Sorry for stealing your silver wig that one time. Your Kansai dialect was cool. To Hiroyuki Matsumoto (Gamel): You were the most talkative Greeed. Gamel was gone for a while, but I was glad when he came back. I got lonely when I couldn’t hear Gamel’s voice during ADR but it was good that I got to hear him again. To Honoka Miki (Mezool): We were only on the set together once or twice, but whether you were showing your K-pop dance moves or just being silly, seeing you always smiling was lovely. To Hikari Tobita (lost Ankh): Since you loved OOO so much and came from the sticks, we became fast friends, didn’t we? When you wrapped and started crying I thought I would too. You were like a cute little brother to me. To Marie Kai (Chiyoko Shiraishi): From the very beginning, you were so cheerful and always listened to me with great interest. I can’t tell the difference between you and Chiyoko, such a beautiful character always got OOO so excited. You played an older sister and you really became like an older sister to me. To Yu Kamio (Kiyoto Maki): When we first met I said you were older than my dad. lol I still remember the time Iwa [Iwanaga] and I took you on and you beat us black and blue. As one would expect from SP! When I get old enough to go drinking let’s go sometime! To Takashi Ukaji (Kousei Kougami): When I first met you I was way too surprised. It was fun listening to your old stories. You taught me a lot about acting and life, I have a great respect for you. To Ryosuke Miura (Ankh/Shingo Izumi): We first met at rehearsal, right? We didn’t get along at first but when I asked what food is good for a guy living on his own you told me about easy-to-make spaghetti. That was our first conversation. Our two personalities are so different, I’m the passionate type and you’re the shy type. At first our wavelengths didn’t meet, and we sometimes used to fight. Do you remember our Ueno and Shinjuku dates? 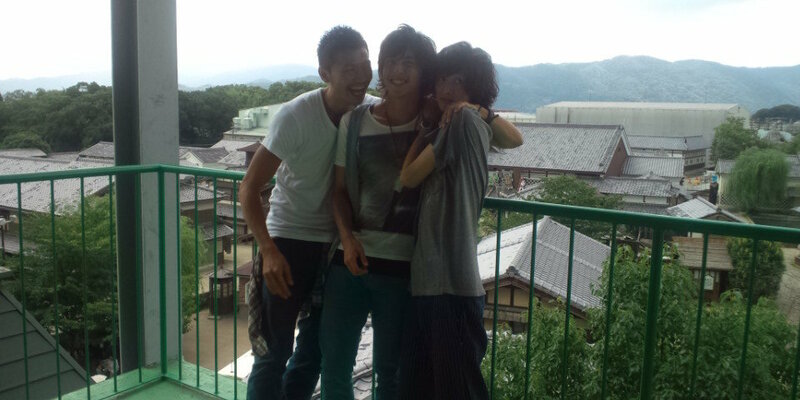 We went out with Eiji and Ankh hair, competing to see who would get found out first. It was always Ankh first. lol When you would leave some food after your lunch I’d always finish it for you. In the last year, how much have you taught me, I wonder? How much have we talked? How much have we been together? I really wanted to be together more. I can’t tell you how grateful I am to you. When I was confused you were right there. On days you weren’t around, I couldn’t really get into the filming. I really needed my partner Ryon! I can’t tell you face-to-face but I’m truly grateful to you from the bottom of my heart. Finally, thanks for supporting me for a whole year. You’re all my friends that I made through OOO. This was thanks to the other cast, the directors, staff, fans, and everyone else. From now we’re going to walk our seperate paths, but if you’re ever lost come back to OOO! Believe a bright tomorrow will come…. It’s a bit late, but I have an announcment to make. The other day, in the night when I came back from the Kyoto event to Tokyo, when the last of the ADR for Kamen Rider OOO finished, the role of Ankh/Shingo Izumi also finished. The night of the 29th was when filming finished but I couldn’t let it be finished for me until the ADR was done. That day, I drank some sake at home. Watching the episode that aired on Sunday, I looked back over the last year once more. A lot of things happened. Well, that’s a year for you. Everyone could say a lot of things happened over the last year, and it was the same for me. I spent more time with the OOO members than with my friends or family. When I had a problem I eventually couldn’t resolve by myself, they were all there for me. Therefore, I put everything I had into the filming until the very end. Of course, I could never count the fun and happy times. To the staff, all the cast, and everyone who loves OOO and has supported us, thank you very much. I have been able to completely finish this task without injury. The show is still airing…. Please watch OOO to the finale. First of all, thank you for your hard work over the past year. I could always feel your love and enthusiasm for this show and cast. Wanting to become a Kamen Rider, you entered this world we call show business and left your parents and home in Akita while you were still just a teenager, chasing your dream. For that I truly respect you now. Do you remember when we first met? You were so passionate, and broke down the walls of my heart without permission and left them like that. At first I hated your innocence. But really, I was jealous. Making friends with anyone quickly, being so sweet, always smiling, making yakimochi, sleeping, eating, yet always smilng. I was jealous…. I could never say it, your personality is so different from mine. In fun times and difficult times, in painful times, when it was cold and when it was hot, when I was nervous or in pain, when we were getting our makeup done, at breakfast, lunch and sometimes dinner or when we slept, you were right there by my side…. It was good that you were OOO’s Eiji. To Kamen Rider OOO and our having met, cheers. Touching words. You can really see how close, how connected people can get in such a short amount of time. And speaking on behalf of all Kamen Rider fans that visit this blog, I would like to say thank you to the cast and staff of Kamen Rider OOO for making such a truly excellent series. Bravo, and SUBARASHI! Special thanks to nerefir of HJU for translating the original blog posts, and to UkiyaSeed of Orends:Range for these wrap-ups to light. Wow….I knew that cast members of a show like this had to be in some way close by the time filming was wrapped up, but I had no idea. This is truly touching and inspiring. I have to admit, this gives me a really huge boost to the respect I have for these two as actors — for the whole cast of OOO really…but those two especially, to just bust out their innermost feelings and thoughts in this way….again, Wow….incredibly amazing and awe-inspiring. I admit to being among the names on a list entitled “World’s Biggest Saps”, but reading this really makes me want to meet these two guys, in fact I say it makes me wish I’d been part of the cast for this show. To know you can walk away from a group of people who you’ve worked with for a solid year and realize how much you truly loved and will miss each of them….to me this is what it means to be a real, true friend. To Watanabe Shu, Ryosuke Miura, and the cast of Kamen Rider OOO….God Bless you all, and may you never forget one another and the relationships you’ve built as a cast, and more importantly, as friends! Previous Previous post: Go-Kaiger Stageshows: Go-Kai Change, Stage Right. Next Next post: Let’s Hold Hands ~ Matsuken x Kamen Rider Samba PV Revealed!